Adopting a ‘hybrid’ model, classes included three live video sessions with UC Berkeley faculty, delivered once a week from Berkeley, CA, USA; as well as mentoring sessions and project work with Indian mentors for 12 hours spread across 3 weeks. In the final wrap-up session completed with UC Berkeley faculty on 6th May, the global innovation experts, Dr. John Danner and Dr. Mark Coopersmith announced the list of the top 10 projects from amongst the 27 participating teams. The most innovative project team led by Amrita’s final year student, Kaushik Velusamy, came up with a low cost Internet of Things (IOT)-based innovative application to control and access all home appliances with inbuilt sensors controlled wirelessly through internet as well as through an android app. His team comprised himself (Kaushik), P.L. Ramumanickam, Naresh Perumal, Sri Jaswanth and M.N. Abijith. The second best innovative project team, again from Amrita, comprised final year student and team leader, Rashmi Menon, along with U. Vipin, Vignesh Karthik, M.R. Jayachanth and P. Dharanidhar. Their innovative idea, titled the Third Eye, was on DSLR Quality Spectacles, based on improving the resolution and providing customized interface to photographic /videographic spectacles available at present. 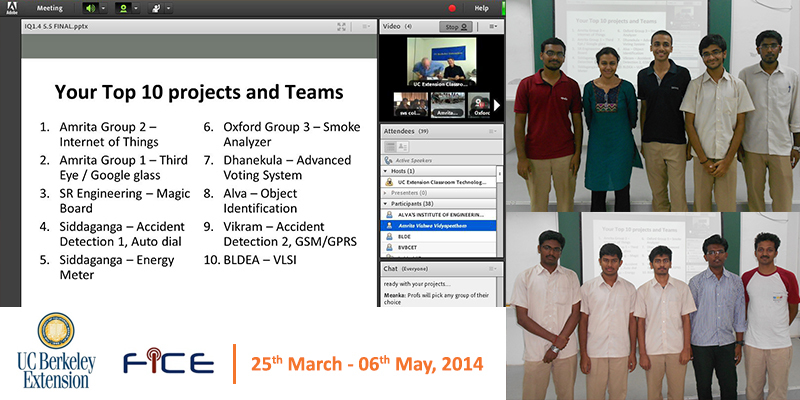 Apart from Amrita Vishwa Vidyaeetham, the other colleges whose team projects got ranked in the top 10 include S.R. Engineering College, Siddaganga Institute of Technology, The Oxford College of Engineering. Dhanekula Institute of Engineering and Technology, Alva's Institute of Engineering & Technology, Vickram College of Engineering and BLDEA's Dr. PGH College of Engineering & Technology, Bijapur. Most participating colleges belonged to the states of Karnataka, Tamil Nadu, Kerala and Andhra.